Lambert Says Sports: Flawed Kings Remembered At Cannes. I heard there is going to be a Tyson vs. Kimbo fight. Poor Mike, can't we just leave him be with his pigeons? Mike might beat Kimbo down. Itll be the resurection of mike tyson into iconic signifigence. No they dont hire guys that speak to ceramic sheep. 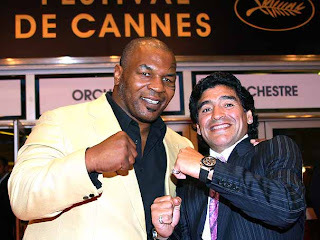 The only thing Mike Tyson might beat down is an ounce or coke! I think Mike wold destro Kimbo in the first round if he trained right. Kimbo is a bum. I could take him if I wasn't busy painting.